For the fourth straight year, Josef Bray-Ali is opening the doors of the Flying Pigeon Bike Shop for a Streetsblog Los Angeles fundraiser. This year, we’ll roll back on Friday, June 14 for a ride and after party at 6 pm. The event will feature the usual mix of bikes, drinks, Mexican food and fun. This fundraiser also has the lowest price tag of any of our events, a cool $10 for both the ride and the party. At the party, we’ll have a video camera set up, for people to say how more bike lanes in streets such as Colorado, Eagle Rock, and Figueroa will make the streets safer for all. After the party, we’ll turn those interviews into a Streetsblog Los Angeles video. There will also be a raffle of Streetsblog, CicLAvia and other bikey schwag. Unlike past years, this year our party comes in the middle of a bike battle in the Northeast. 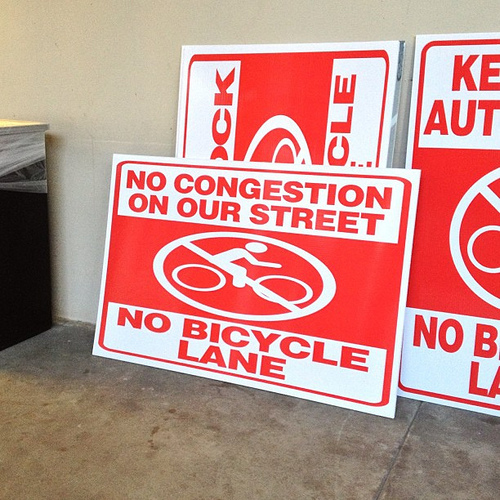 As LADOT completes the public process to put NELA streets on road diets and add bike lanes, a truly enraged backlash has consumed the local media. The Boulevard Sentinel’s regular coverage reads like the most unhinged Beverly Hills Courier editorials. Anti-safety advocates have taken to putting anti bike lane signs in their windows, despite being told that it’s hurting their business. With our video, we can tell these businesses in a friendly way that they have nothing to fear from bike lanes, or from bike riders. Don’t Forget, Tomorrow Night We Ride from Flying Pigeon Throughout Northeast L.A.